Max and Mr. Star welcome CC the Cat on their continued theory expedition in Theory Fun 2A. The theory book in the series expands and reviews all topics in level 1 books and introduces pickups, musical signs and terms, leger lines, naturals, intervals of seconds and thirds, and key signatures. The material is presented and reviewed through appealing exercises, word searches, fill in the blanks, cross word puzzles, poems, and matching games. 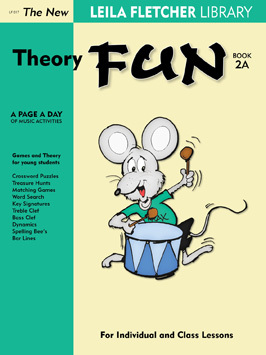 Theory Fun 2A is equally effective for both classroom or private study and was written to compliment any method series.